A slight dogleg to the left with the green surrounded by trees and protected by several bunkers, which leaves a clear entry down the middle. the tee shot requires more accuracy than power to achieve the correct angle for attacking the green with the second shot. 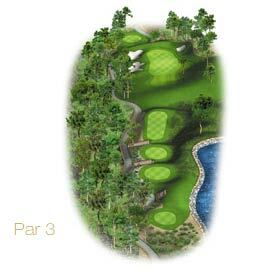 An easy, albeit long hole to start off with, providing the tee shot is played right. Practically straight and slightly uphill, with the green in a relatively narrow area which will require an accurate shot. It is safer to lay up short, but this makes the possibility of par more difficult. The first par 5 on the course. 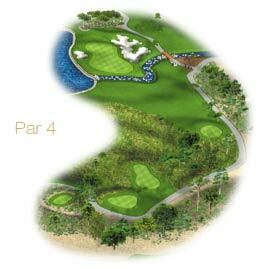 It is a long hole but the tee shot is played downhill. 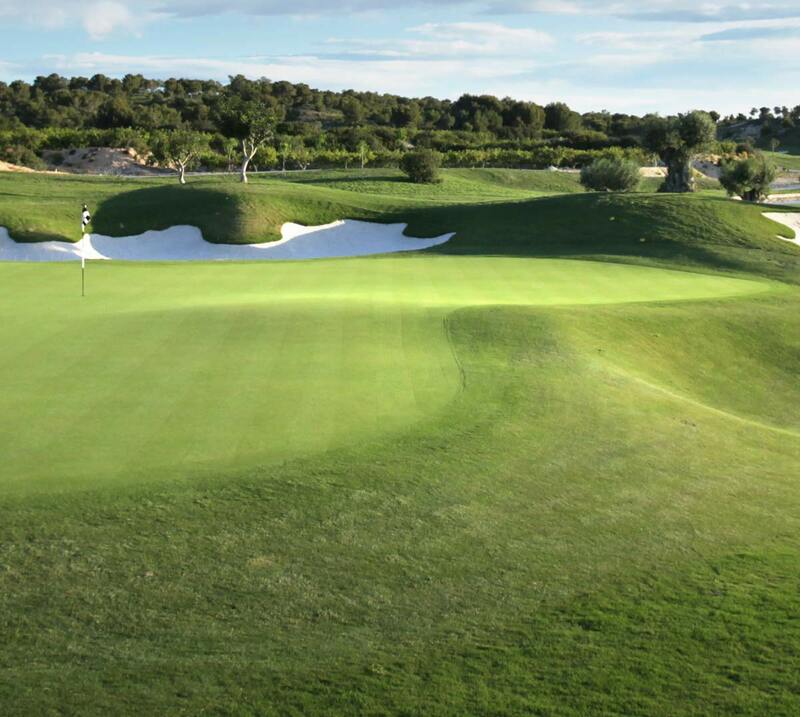 The main difficulty of this hole is the second shot, which needs to be very long for those who want to attack the green in two or very precise for those who lay up short because of the lakes that protect the green. A short hole which could be useful for making up for a bad start. A conservative tee shot is no problem, but go too easy and the possibilities of a birdie will decrease. If players aim straight at the green with their tee shot, the shot has to be very accurate, because of the fairway on either side. 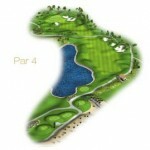 A long par 3 where the green is protected by a lake on its left. A pin position front right will be the easiest, but if it's set back left the tee shot will need to be accurate to achieve par. 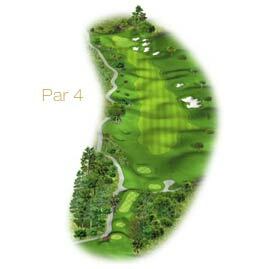 The hole's green is on a slight uphill slope, meaning the second shot approach will be the most important for the chance of achieving par. 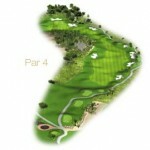 The tee shot is not complicated but the ball will have to be placed well because of the difficulty of the second shot. A spectacular downhill tee shot to start. 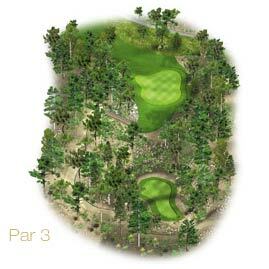 The second shot requires accuracy as the green is well guarded by bunkers. 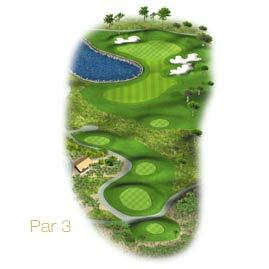 It is a hole that requires careful placing of the tee shot to have a chance of par. The last par 4 of the front nine, leading back to the Club House. The tee shot is played as a slight dogleg to the left, which, if played correctly means that the player will then have a clear route to the green. However, the green is well protected by bunkers and so an accurate approach shot is still required. Short par 3 on a slight downhill slope. A split level green means that the player will have to put the ball in the right place to reduce the risk of three putting. 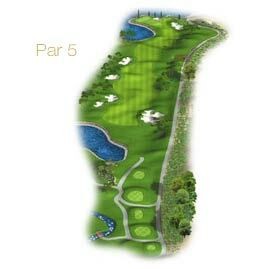 The longest par 5m but on a slight downhill slope, and so shorter-hitting players can still reach the green in three shots. The whole length of the fairway is well protected by bunkers, which adds a danger for players who decide to go for power from tee to green rather than accuracy. 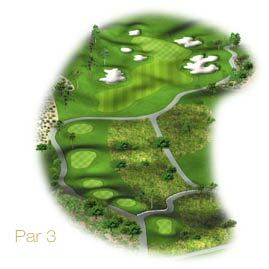 A short hole that can be useful to improve the player's scorecard. 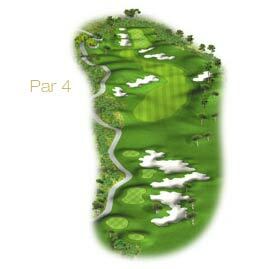 A birdie is achievable, although there is some risk because of the buynkers on either side of the fairway. It can be played in a more conservative manner to ensure par. Magnificent tee shot with a large lake to the left of the tés and fairway. 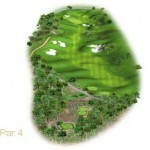 It has a visual effect on this shot, and will impose on the player as the hole is a slight dogleg right, meaning the left-hand side of the fairway gives the best angle for the approach to the green. Here again there are several bunkers, but a ball well placed on the fairway will offer the possibility of comfortably attacking the green. 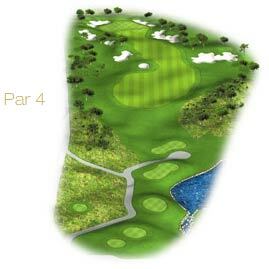 An average-distance par 3, so there is no need for along club to reach the green. But, with water at the front and side, and bunkers to the right of the green, the shot has to be accurate to avoid trouble. 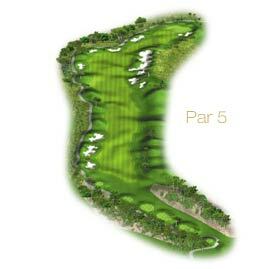 The third par 5 on the course. 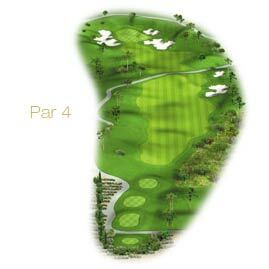 With a good tee shot, the player has to decide carefully how to play the second shot, as the green is on a peninsula in the lake attacking the green is possible but risky, whereas more conservative play can ensure a par. 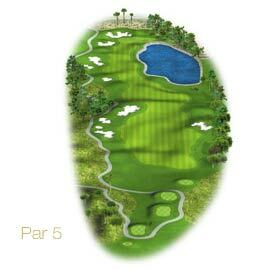 A long par 4 with water to the left of the trees and fairway. It presents the player with another decision as to whether or not to take a risk with the tee shot, and set up a possible birdie, or to play more conservatively, leaving a longer shot, and aim for par. 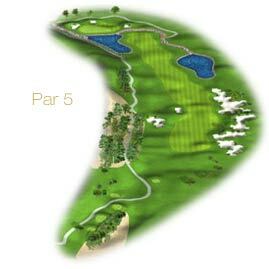 Many great courses have a par 3 on either hole 16 or 17 because it as often here where championships are decided, as par 3's such as this are more difficult to get a birdie on, and easier to come away with a bogey. An impressive par 5 to complete the course. With a tee shot over the brow of a hill, a spectacular second shot is then revealed, with the Clubhouse in the background and a magnificent lake defending the green on the right.